Oh no! Chubbs was hospitalized yesterday evening! We took him to the vet as soon as B arrived home. Chubbs was getting weaker; extremely listless. It was worrying to see him not responding to my many calls. He hasn't eaten for two days too! The vet examined Chubbs; checking for possible mouth ulcers, which could be the reason why he's refusing to eat but there were none. His temperature was also very low, on the verge of hypothermia, which our Vet attributed to him not eating or drinking. Chubbs appeared to be suffering from dehydration and our Vet insisted we leave him behind for observation. He will be put on a drip immediately and will be forced fed to ensure he gets at least some food in him. Some tests are scheduled for my baby today including a blood test to determine if he's suffering from any poisoning, viruses or internal failure! Poor Chubbs looked so sad last night when I scratched his head and held his paw as I bid good bye to our oldest meow. Frankly, B and I are a little worried and we are hoping for some good news from the Vet later this afternoon. Oh this reminds me of the time Benji was hospitalized! Oh No!!!! I'm so distress now GP! Did the vet say when he was going to call?? oh woman.. hugss!!! LOL!!! I can imagine LJ cepat2 chop ha ha, congrats FC1! Ohh please get well Chubbs.. Aunt LJ now so sad for your master!! oh, no! poor chubbs! hope he'll get well soon! i hope chubbs get better soon also. eh but best leave him at the hospital..at least he gets him some liquid and food..poor chubbs.. how old is he GP? some TLC jer. I'm sure!! Bill, no problems accessing your site at this add! Glad u got the chop here LJ, which blog today? Tapi takde temperature Lj, as in fever temperature! So not fever it seems! Benji that time the doctor pun nak menangis seeing small baby Benji sick! Yelah.. I see the picture of Benji also I want to cry! I will be praying for dear Chubbs ok! bandage.. but tak mao citer pasal Mufasa lah.. sedih. Chubbs would be fine I'm sure!! Yeay! I know u will dearie, thanks so much and here’s to 9 lives coming true! Hah.. maybe that food that agree with him kot?!! ctr.. jauh tu. sayang punya pasal kan?? Exactly! Sayang punya pasal sanggup redah trafik visit Benji, doctor oso happy to see our eagerness. MEOW! Thanks for the hugs LJ, MEOW! Thank you Bem Bem, mmg pity my baby la! No wonder la puked 2x that day and then no energy to move oso! I hope my Vet can do something abt Chubbs or not lagi kaut la I terpaksa menyodel di sini! You know once Marzie, a vet lost one of my cats, my mom's fave lak tu. What do u mean the vet lost ur cat Bem Bem??????? How???? Recent blog post: Crotch Grabbing! Oh no! Ran away??? And then, u all tak mengamuk kat vet tu ke? Kalau I for sure dah throw HUGE tantrum!!!!!!! Lost the cat. Smokey was the son to MY favourite cat, Juju. Alalaa.. kesian smokey. kesian ur mom, bem..
Ish nak kena sue la that vet! 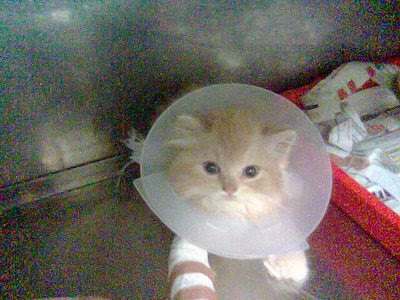 If my vet hilangkan my cat/s, waaaaaatch me mengamuk satu Damansara LOL!!!! Yalah kan.. how can like senang2 je nak lose people's cats! to go back home.. :-( :-( me pulak yang sedih..
Tu la, pas tu cakap sorry pun it won bring back the cat! So careless! 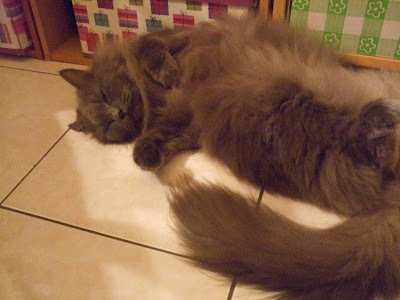 tu la kesian, mimpi bukan sebarang mimpi, mimpi smokey mati tu, ran over. Alaaa.. dowan to read lah any more smokey stories.. makes me sooooo sad..
me cryyy.. or you want to make me kempunan. uwaaaaaaaaa!!! juju's cerits. huhuhu. oh ya! Bila u nak gi watch star trek? Bessssssssstos! think even non trekkies will enjoy this one and convert to being trekkies..
and ohh.. the trekkies that were watching seemed really puas hati..
ikut jugak.. KAMON LAAAAH!! LOL! should have SHHHHHh loudly or outtalk them. they first unveiled the enterprise.. LOL! Marzie!!! How is Chubbs? I hope he's okay!! Please keep me posted okay! Hugs Marzie, I know you must be worried! Hugs to Benji and Phoebe, I know they must be worried too! I'm seating on the edge of my seat waiting for you to post results Marzie! Hey Bem, I'm a die hard Trekkie. You calling me a nerd? LOL! Shemah - Sighed? I almost fainted when they revealed the new enterprise ... LOL! hyperventilating lah mostly! I already cried during the intermission!! LOL! Oh Poor Chubbs, get well soon buddy! oh poor kitty! i wish Chubbs the best speedy recovery. you and B must have been worried sick about him. i hope he'll get better soon. i'll keep him in my prayers. OMG, what bad news! Get well soon Chubbs! Oh, Marzie, so sad to hear about Chubbs in hospital. Hope your little kitty comes home to you soon. Came on over because I was happy to see your Entrecard on YourDailyCute.com, but then saw the news that Chubbs isn't feeling well... I hope it turns out to be nothing serious, and something that he can get better from real soon! I'll keep Chubbs (and you) in my thoughts. Please keep us updated. Cats are like children, and such a big part of our life. Get well soon, Chubbs!! Alamak cian nya your mom! Kalau I pun.. I sue for sure! Oh dear.. cian nya your mom., kalau I pun mesti trauma ! Hahah.. yelah GP.. ME TOO!!! I pun sedih Shemah.. can you imagine him all scared ! Oh yay smokey the bear in da house! Meow! Hear hear.. sue them all! !